Chapter 11 described deterministic procedures for computing the orientation of a single spacecraft axis and estimating the accuracy of this computation. The methods described there may be used either to determine single-axis attitude or the orientation of any single axis on a three-axis stabilized spacecraft. However, when the three-axis attitude of a spacecraft is being computed, some additional formalism is appropriate. 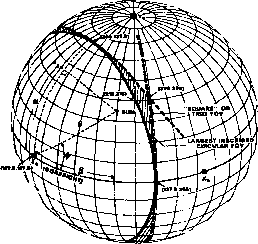 The attitude of a single axis can be parameterized either as a three-component unit vector or as a point on the unit celestial sphere, but three-axis attitude is most conveniently thought of as a coordinate transformation which transforms a set of reference axes in inertial space to a set in the spacecraft. The alternative parameterizations for this transformation are described in Section 12.1. Section 12.2 then describes three-axis attitude determination methods, and Section 12.3 introduces the covariance analysis needed to estimate the uncertainty in three-axis attitude. The basic problem is to specify the orientation of this triad, and hence of the rigid body, relative to some reference coordinate frame, as illustrated in Fig. 12-1.